(Nanowerk News) The kidney - made up of about a million tiny units that work to filter blood, constantly rids the body of undesired waste products to form urine while holding back blood cells and valuable proteins, and controls the body's fluid content. Key to each of these units is a structure known the 'glomerulus', in which so-called podocyte cells wrap themselves tightly around a tuft of capillaries separated from them only by a thin membrane composed of extracellular matrix, and leaving slits between them to build an actual filtration barrier. Podocytes are also the target of many congenital or acquired kidney diseases, and they are often harmed by drugs. 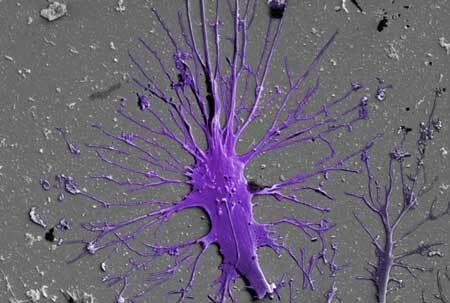 A team led by Donald Ingber, M.D., Ph.D., at Harvard's Wyss Institute of Biologically Inspired Engineering now reports a solution to this challenge in Nature Biomedical Engineering ("Mature induced-pluripotent-stem-cell-derived human podocytes reconstitute kidney glomerular-capillary-wall function on a chip"), which enables the differentiation of human induced pluripotent stem (iPS) cells into mature podocytes with more than 90% efficiency. Linking the differentiation process with organ-on-a-chip technology pioneered by his team, the researchers went on to engineer the first in vitro model of the human glomerulus, demonstrating effective and selective filtration of blood proteins and podocyte toxicity induced by a chemotherapy drug in vitro. Ingber is the Wyss Institute's Founding Director, the Judah Folkman Professor of Vascular Biology at Harvard Medical School (HMS) and the Vascular Biology Program at Boston Children's Hospital, as well as Professor of Bioengineering at the Harvard John A. Paulson School of Engineering and Applied Sciences (SEAS). Ingber's team has engineered multiple organs-on-chips that accurately mimic human tissue and organ-level physiology and that are currently being evaluated by the Food and Drug Administration (FDA) as a tool to more effectively study the effects of potential chemical and biological hazards found in foods, cosmetics or dietary supplements than existing culture systems or animal models. In 2013, his team developed an organ-on-a-chip microfluidic culture device that modeled the human kidney's proximal tubule, which is anatomically connected to the glomerulus and salvages ions from urinary fluid. Now, with the team's newly engineered human kidney glomerulus-on-a-chip, researchers also can get in vitro access to the kidney's core filtration mechanisms that are critical for drug clearance and pharmacokinetics, in addition to studying human podocytes at work. The complete microfluidic system closely resembles a living, three-dimensional cross-section of the human glomerular wall. It consists of an optically clear, flexible, polymeric material the size of a computer memory chip in which two closely opposed microchannels are separated by a porous, extracellular matrix-coated membrane that corresponds to the kidney's glomerular basement membrane. In one of the membrane-facing channels, the researchers grow glomerular endothelial cells to mimic the blood microvessel compartment of glomeruli. The iPS cells are cultured on the opposite side of the membrane in the other channel that represents the glomerulus' urinary compartment, where they are induced to form a layer of mature podocytes that extend long cellular processes through the pores in the membrane and contact the underlying endothelial cells. In addition, the device's channels are rhythmically stretched and relaxed at a rate of one heart beat per second by applying cyclic suction to hollow chambers placed on either side of the cell-lined microchannels to mimic physiological deformations of the glomerular wall.